When one looks at the statistics, the people with the most followers on Twitter are typically rock stars like Katy Perry, Justin Bieber, Rihanna or sport stars like Cristiano Ronaldo, Neymar, LeBron but surprisingly in position No. 3 is Barack Obama. In No. 18 we have Donald Trump who beats the top 30 (including Justin Bieber) by a very wide margin in terms of the number of Tweets sent out to date. Since joining Twitter in 2009, it is said that one in every eight posts from Trump is a personal insult of some kind. However, there is no doubt that he has used Twitter to his advantage during the 2016 election campaign and more importantly after being elected has been able to notably influence market moves via Twitter. The above chart illustrates the power of an overnight Trump tweet in influencing markets and/or individual stocks. Referred to as Wall Street’s cheerleader in chief by CNBC, Trump has the power to make or break a company’s share price, at least temporarily, creating short term trading opportunities. 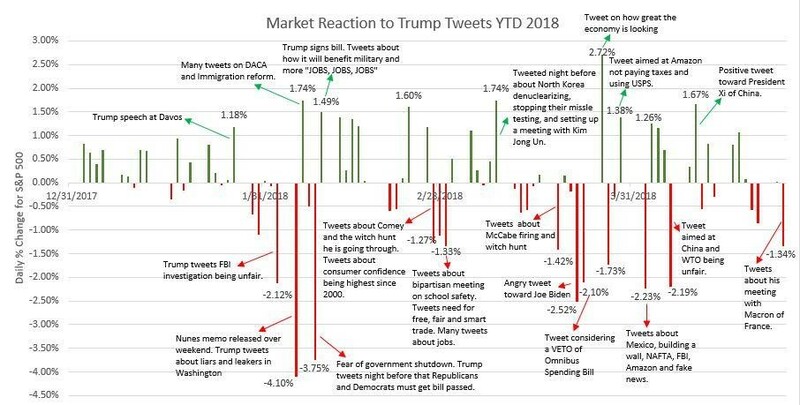 It should be no surprise that many money managers (both discretionary macro and equity long / short) have become hooked on Trump’s Twitter feed as it has become an interesting source of trade opportunities. One of our macro managers recently mentioned in his letter to investors the term Twitternomics, or Policy Making by Twitter, which has cut the middleman in US policy-making and added greater transparency and accountability. Who would have thought of creating a short term trading signal to trade the US market based on overnight Tweets from Trump. Even the most famous day trader of Wall Street (William O’Neill of Investor’s Business Daily) would never have dreamt this could be possible. Next Chart of the Month - Small caps versus large caps: small is beautiful… Especially in Europe!